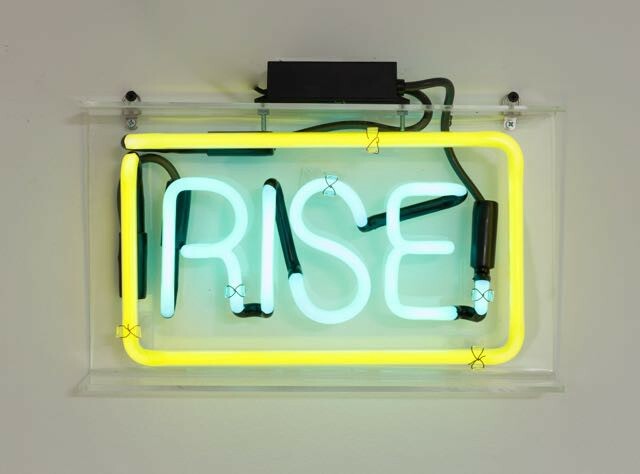 “Rise” by Patrick Martinez for We Buy Gold in NYC. This is America: police brutality and pop culture. Immigration and the NFL. Gentrification and…Drake. These are all themes explored by artist Patrick Martinez, who was born and raised in Los Angeles to a Native American and Mexican father and a Filipino mother, and uses neon, ceramic, and mixed media installations to unpack the idea of the American Dream. On the Internet, he is mostly known for his neon installation Less Drake, More Tupac, which Drake actually bought and currently displays in his home. I talked to Martinez as he wrapped up his first solo show at L.A.’s Vincent Price Museum and prepared for the next edition of neon installations on sale at We Buy Gold, Joeonna Bellorado-Samuels’s roving art gallery, now open at 179 East Broadway in New York City. 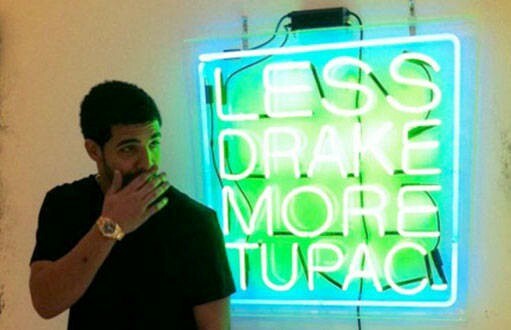 Drake posing with Patrick Martinez’s “Less Drake, More Tupac” (2011). “The Vincent Price Museum is on the campus of East L.A. College. I’m from that area. I knew there were a lot of DACA recipients and undocumented students there, I just didn’t know how many. There are about 2,000+. So I wanted to speak to them in the show and then also the ideas about gentrification and the foundation of homes slipping away from a lot of people—it’s not so concrete anymore, it’s more like quicksand. It’s like, Damn, where do I go? Rent is so expensive I can’t afford it. I’m getting priced out of the neighborhood. Am I or my friend going to be able to stick around? What is home? When I think about the wall the current administration is trying to build and barriers like these ‘gentrification fences’ [in L.A.] and some of them are so tall you can’t even see the home. All this talk about walls and barriers — all these things isolate people. “The ‘dream,’ earlier on for me in my life growing up in America, it really felt like certain things would be doable. Like at this point I thought I’d own a home. It’s not the experience my parents had—even though they were struggling at times, they still made stuff happen. It just feels like a lot of that stuff is slipping away. I’m 37 now. It’s not the same type of life my dad had [at that age]—not that it’s easier or harder. He had kids, he had a home. It’s hard out here financially in Los Angeles particularly. The cost of living is so crazy. So a lot of things are just further out of reach.